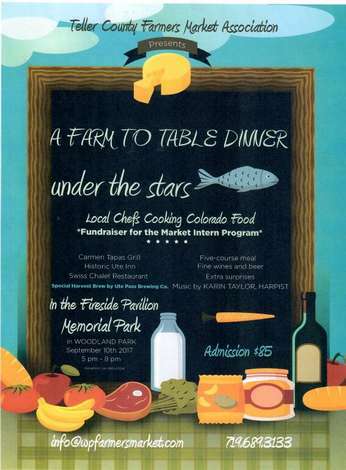 The first Farm To Table Dinner presented by Teller County Farmers Market Association as a fundraiser for the Market Intern Program. Celebrating the new Memorial Park improvements, and also the new site for the farmers' market, with a dinner for 60 under the park pavilion, and beside the stone fireplace. A five-course menu, opening with informal mingling accompanied by appetizers and drinks, then seated service, to a background of music from harpist Karin Taylor. Dress optional. Your servers will be market volunteers. Ute Pass Brewing Company will provide a special Harvest Beer, made with items found at the market! Appreciation gifts donated by market vendors. All donations fully tax-deductible with a receipt from TCFMA (a 501(c)3 organization). 8/21 ONLY 40 TICKETS LEFT!